Why would you want to stop letting pitchers hit? Yesterday, a visual case for adding the designated hitter to the National League was laid out. Don’t listen to anything that guy writes. Anyone who really understands baseball knows we should eliminate the DH entirely. The crux of yesterday’s case was that pitchers can’t hit at an acceptable level, creating a subset of major league at-bats that do not resemble the usual competitive balance between pitcher and batter. Further, it often distorts the at-bat for the batter who immediately precedes the pitcher in the lineup. Today, we’ll take a look at the underlying fallacies of said argument, as well as present several other arguments prosecuting the case against the DH. That pitchers, as a group, don’t hit very well cannot be disputed. That they can’t is a completely different issue. Pitchers are not ordinary human beings, nor are they lacking in two core skills required to hit major league pitching, specifically, having elite arm-hand speed combined with elite eye-hand coordination. A player who can throw a ball 90+ mph with enough coordination and accuracy to get it into small target 60 feet away has the requisite physical tools to hit major league pitching. What is missing is not the physical ability to hit major league pitching. Rather it is the training, desire and social conditioning that are preventing pitchers from becoming useful hitters at the major league level. In many ways, the existence of of the DH provides a market disincentive to invest in a pitcher’s ability to hit, since for half of the major leagues, this value is non-existent. Thus, even if a pitcher is being groomed by a National League team, the element of the prospect pitcher’s value that is determined by his trade value dictates there is little value in developing his hitting. This goes further than just a value statement, or a risk/reward decision made by senior personnel. It speaks to social conditioning with respect to the pitcher position, specifically that it is okay for a pitcher to provide negative offensive value so long as he can pitch. If the DH were to be eliminated, teams could create a significant competitive advantage by investing in developing their pitchers’ collective ability to hit, creating surplus runs with pitchers who out-hit their counterparts by a consistent margin. The DH rule makes this more difficult, since pitchers move around and often lack the basic wherewithal to compete as a hitter. Further, the societal expectation that pitchers don’t need to be good hitters percolates throughout the baseball development system, all the way down to Little League, where, if you are a great pitcher, little emphasis is placed on being a great hitter. Were this to change, I would suggest that pitchers over time would fit more naturally on the defense-offense trade-off curve, representing a drop off from the second base/shortstop hitting level that is closer to the gap between middle infielders and third basemen/right fielders. If we accept the premise that pitchers shouldn’t hit because they don’t hit very well, we are essentially making the argument that when a position’s ability to hit is significantly worse than average, we should replace that position with a designated hitter. If we follow this logic, we would then see merit in allowing teams to have a pure defensive shortstop who would have his own designated hitter so he can focus on being an optimal defensive player (lighter, quicker, more agile, etc.) without having to worry about adding things that might offset his defensive ability (extra weight/muscle, time wasted working on hitting instead of a pure focus on defense). This approach then could apply all the way down the defensive spectrum, including first base, where we ideally would have a tall, agile player who would otherwise be playing basketball or tennis, who would be well suited to stretch for errant throws but also be able to get to balls laterally. First basemen could focus all their time and energy on optimally fielding the position without having to expend any valuable time on working on hitting, leaving that entirely to their corresponding “designated” hitter. Tradition, on its own, is not necessarily a good thing, especially in situations such as the “traditional” role of women or people of color in society, or the exclusion of arbitrary matrimonial gender pairings, where tradition is a direct impediment to necessary, vital cultural progress. Such is not the case with respect to the designated hitter rule, which since its introduction in 1973 potentially has led to the regression of pitchers being able to handle major league pitching (more on that later). The other forms of tradition, such as tailgating at an NFL game, Hockey Night in Canada, NBA Christmas Day, etc., all add flavor and depth to our collective sporting experience. 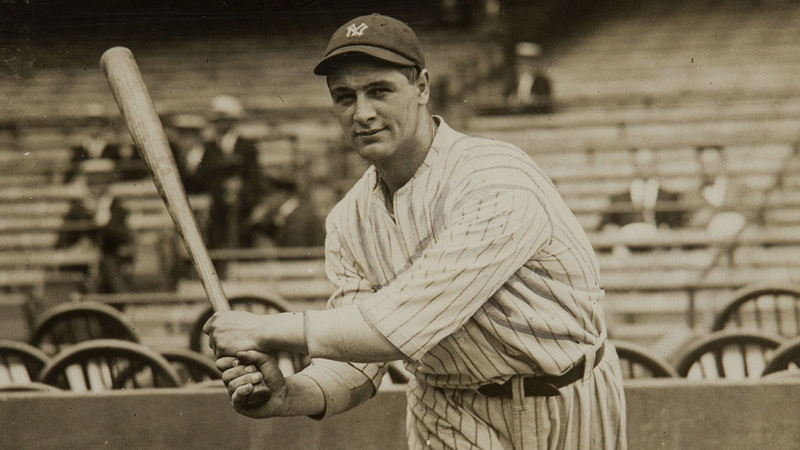 The DH countervails part of the rich tradition of major league baseball–specifically the history of pitchers hitting for themselves–and is a constant buttress against this history. The argument for tradition goes beyond the theory that the history of the game should be conserved. It speaks to the essence of baseball, which is that every position is unique, with its own strengths, weaknesses and trade-offs, and there shouldn’t be one position singled out that requires two individuals to share the role. Baseball is the one team sport in which each athlete can be held accountable for the bulk of his individual performance. We should celebrate that and hold pitchers accountable for their ability or inability to hit their position. The other aspect of this argument pertains to the concept that each hitter should, at some level, be able to play the other side of the game. Having a designated hitter with no defensive responsibilities runs anathema to this concept. Based on wRC, pitchers have been declining for quite a while, with a small bump post-DH (possibly due to better hitting pitchers switching to the NL), followed by the continuing decline of pitcher wRC. It’s difficult to blame the DH rule for this decline since it clearly started before the DH rule was instituted. wRC is a relative stat, and in this case it could be quite difficult to parse out true ability from relative ability. With this in mind, I wanted to take a look at a binary, non-relative metric–home runs per 100 plate appearances–to see if the DH had any effect on pitchers’ ability to hit homers. 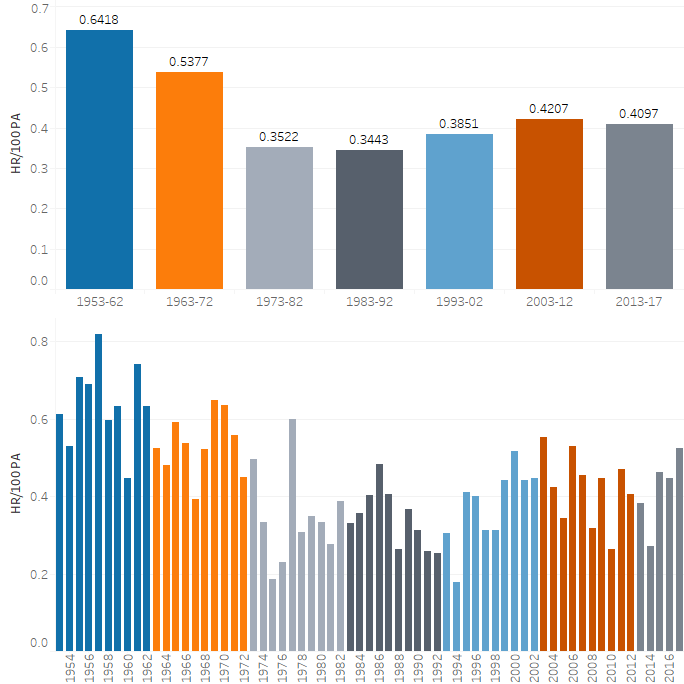 The top and bottom are showing the same data, with the top split out into decades and the bottom into individual seasons. Here we have a very clear signal, with pitchers in the two decades prior to the DH rule being implemented hitting far more HR/PA than any other decade since, with a particularly steep decline in the three decades directly after the rule adoption, which includes both home run “boom” periods. This year’s 0.523 HR/100 PA during a historic season for long balls is still below the average in the 1963-1972 time period, when pitchers were expected to contribute offensively. These data support the theory that a large element of why pitchers don’t hit well is the lack of expectations placed upon pitchers to contribute on the offensive side of the ball. In yesterday’s piece, we spent an extensive amount of time focusing on the big picture that pitchers can’t compete on the offensive side of the ball. 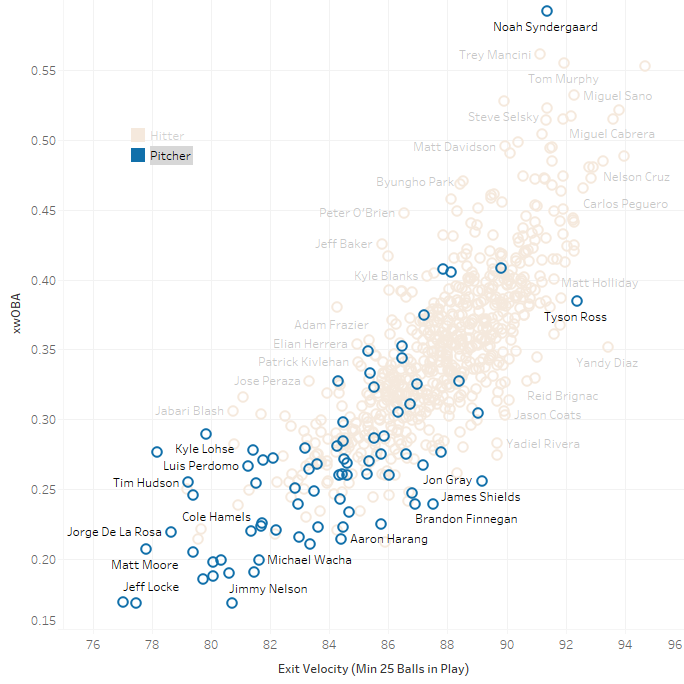 Here we’ll look at the distribution of expected wOBA based on the exit velocity and launch angle. On the hitter side (i.e., all non-pitchers) we see that roughly six percent of all hitters have an xwOBA below .270 and approximately 19 percent are below .300. On the pitcher side, the average pitcher would thus equate to a fifth-percentile hitter, with the top 10 percent of pitchers very close to average. Keep in mind, this is only for situations when the ball is put in play, thus focusing more on pure hitting ability (damage done on contact) rather than experience (working counts, pitch recognition, etc), implying that if pitchers were to focus more on their hitting, a healthy percentage would be acceptable major league hitters. 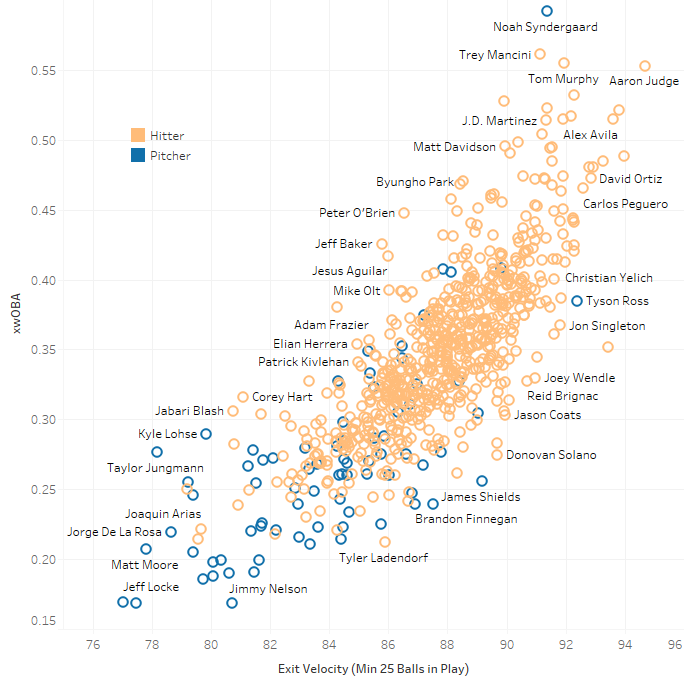 I’m going to show you three graphs, one of which was part of yesterday’s piece and showed exit velocity compared to xwOBA, to show how often pitchers are at the low end of both metrics. All three visuals will show the exact same data. With only slight variations, however, the stories they tell will be radically different. 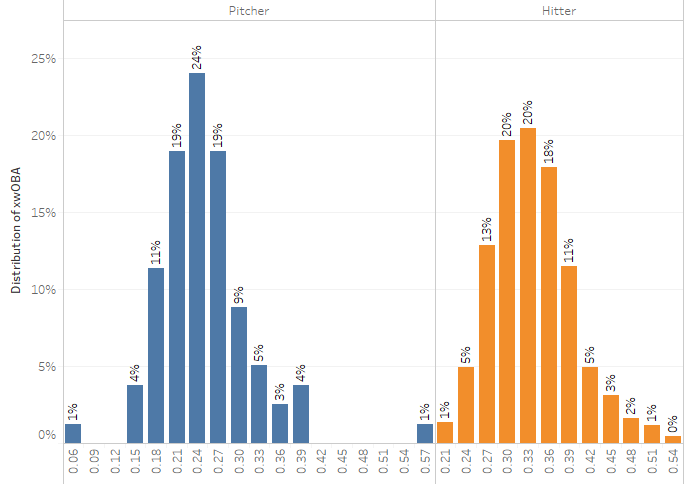 This is the chart used in yesterday’s piece, with all the blue pitcher circles buried behind the orange hitter circles, leaving the visual impression that there were relatively few pitchers in the middle-middle section of the graph (i.e. somewhat average). This is what happens when we flip the pitchers on top. With the same visual, we can now construct the narrative that while there are a host of pitchers that are just plain horrible, a strong portion of them are comfortably middle-middle and resemble (when they make contact) normal major league hitters. In this version, we’ve focused on just the pitchers, bringing them to the foreground and fading out all the hitter circles. 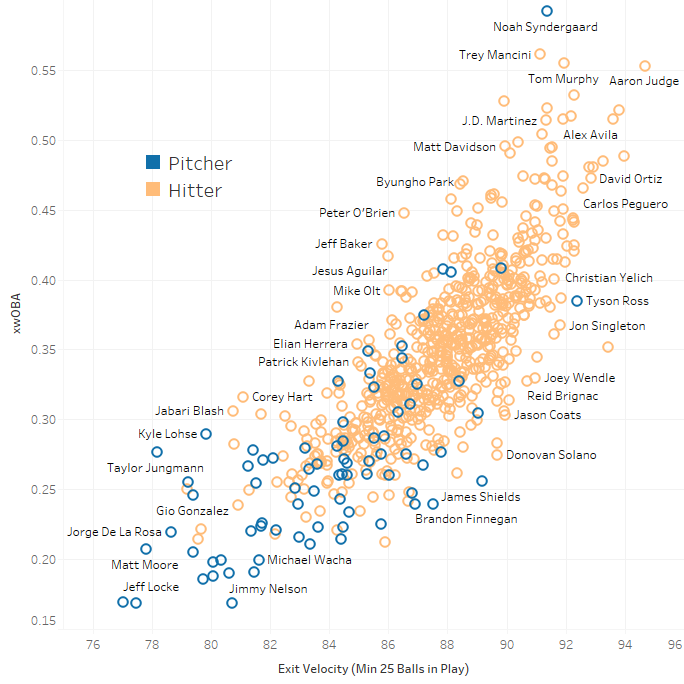 This shows that pitchers seem to distribute themselves all over the chart, with the bulk clusterd around the 84 mph, .240-to-.270 xwOBA mark (similar to the chart above). This chart–combined with the distribution chart–supports the theory that pitchers are capable hitters who are being dragged down by a host of pitchers who just don’t event try. Thus, we shouldn’t adopt the DH because a lot of pitchers don’t try; we should eliminate the DH and provide more incentive for pitchers to improve as hitters. The existence of the designated hitter in the American League provides a constant competitive disincentive for pitchers and organizations to invest in developing their pitchers as hitters. While it is hard to prove the DH is completely at fault for the continuous decline of pitcher hitting ability, there really is no compelling pure baseball reason for continued use of the rule. Even if we accept the fallacious assumption that pitchers don’t hit very well (enough hit well enough when they make contact), it does not imply that they can’t. Further, it would stand to reason that if any position were to fall too far on the wRC+ ladder, it could be subjected to the DH rule, further distorting the game from what it should be: one player per position at one point in time, not one player for eight positions and two players for one specific position. It’s time for all pitchers to hit for themselves. Let’s designate the DH rule for assignment. It really would help keep the pace of play nice and brisk too. This is spot on. That guy yesterday didn’t know anything! I understand the desire to continually write articles about why the game is better without the DH, but the reality is that it’s never going away. The player’s union would never negotiate a contract that was essentially taking jobs away from players, i.e. aging sluggers who can’t play the field anymore. The DH is here to stay forever, NL fans should just be happy it hasn’t been implemented for their teams yet. It’s just that your team has never been that bad. In 2010 and 2011 I listened to Twins games to listen to Jim Thome hit. I grew up a Twins fan and am now a Nats fan. I used to think the pitcher batting was really stupid. I now like NL play more–even though the Nats are basically an AL team that is in the wrong league. My preference for NL play is, unfortunately, ineffable. So, I’ll stop typing. There is a balance between defense and offense for every position. However the effect that pitchers have on run prevention mean that hitting will always pale in comparison in terms of importance for them. Also Starting pitchers only play one game out of every five and average about 2 PA per game. Starting position players play 9 innings almost every day and average about 4 PA per game. All told, regular position players get 9 times the PA of starting pitchers. Thanks for the response, by the way. Love discussing this sort of thing! I definitely feel like I’m in the minority but I enjoy having the DH in the AL and no DH in the NL as otherwise there’s not really any difference between the two leagues any longer. That said I enjoyed both articles. The bigger issue is with starting pitchers getting hurt. They are paid MUCH more nowadays then they were in the 1950’s and you would rather hope to avoid non-pitching injuries, like running the bases, and focus their training to reduce injury. The high cost of starting pitcher salaries is why the DH makes competitive sense in today’s luxury tax baseball system. I guess that’s not really in baseball. Busy morning. Just go back to ignoring me. Have you taken into consideration how many times a pitcher has intentionally left the bat on his shoulder, sometimes when given the order by the manager; sometimes when he takes it upon himself? Terrific piece of satire, Eli. You had me chuckling throughout. You are an expert troll. Thanks. I understand the draw to tradition, but not all pitchers are, as the article seems to try to suggest, certainly capable of being good hitters. Furthermore, if baseball had originally been created with a DH for the pitchers and 100 years later somebody said, “Hey, I have an idea! let’s have the pitcher bat!”, well, everyone would think that person was an idiot. It’s more like 1/20 ABs, not 1/9, due precisely to the extra layer(s) of strategy that weak-hitting pitchers give to the NL game. Just looking at the 2017 stats of my hometown Pirates, 237 of 4674 ABs (5%) have been pitchers.